We all know Zombies. We all feel scared while watching their movies. Dead people raise from their graves with horrible looks. They return to life by black magic and incantations. So weird, right? Do you think that Zombies are here on the earth? It’s out of the question. But in fact one day there were Zombies on the earth. How come? Let’s see. Who is the real Zombi whom we really mean? His name is Zumbi, he was a man from an African origin. He was a legendary black hero and freedom fighter. From the very beginning, North and South America were under the control of the Christian Europeans. Brazil was controlled by Portugal. In order to despoil all their wealth, they started by killing the native people: the approach that was always followed by invaders. It wasn’t enough for them, so they attacked the Muslim countries in west Africa in order to make them slaves to move the huge amount of gold to Portugal. What a scandal! Carrying free men on big ships and putting them in the basements. They captured them as slaves for the first time in 1538. It was just the beginning. Then, the Africans brought to Brazil were from different ethnicities and from different African regions. The occupation government always claimed that Africans were ignorant, barbaric, and worthless. However, the famous historian Gilberto Freyre said that some Africans in Brazil were Islamic, spoke Arabic and many of them could read and write in this language. Freyre noted that many slaves were better educated than their masters, because many Muslim slaves were literate in Arabic, while many Portuguese Brazilian masters could not even read or write in Portuguese. These slaves of greater Arab and Berber influence were largely sent to Bahia. As well, the Africans had developed agriculture, raised livestock, domesticated animals such as goat, chicken, and dogs and produced sculptures in wood. The Portuguese government oppressed the Africans and tried all ways to make them revert their religion (Islam) and convert to Christianity. They thought that they succeeded in their mission and got rid of Islam and Muslims forever. Suddenly, a great Muslim hero appeared in the scene. Zumbi gathered with the good imams to teach people Islam, Quran (i.e The final scripture revealed from The Creator) recitation and the real principles of freedom. Therefore, people became aware and united to rebel against oppression and terrorism. Then, Zumbi dropped the bombshell by announcing the declaration of the Islamic state of Brazil in 1643. The Constitution of the state was mainly based on the following: freedom is the very essence of the rule. Subsequently, Portugal declared war against the Muslims’ state, but Zumbi’s forces won the war. The Muslims’ state made a lot of advancements and this state lasted more than 50 years. Zumbi was able to get rid of the slavery in Brazil. He was finally captured on 20 November 1695. He was immediately beheaded and his head was put on public display to convince the locals that there is no freedom anymore and welcome back to slavery. 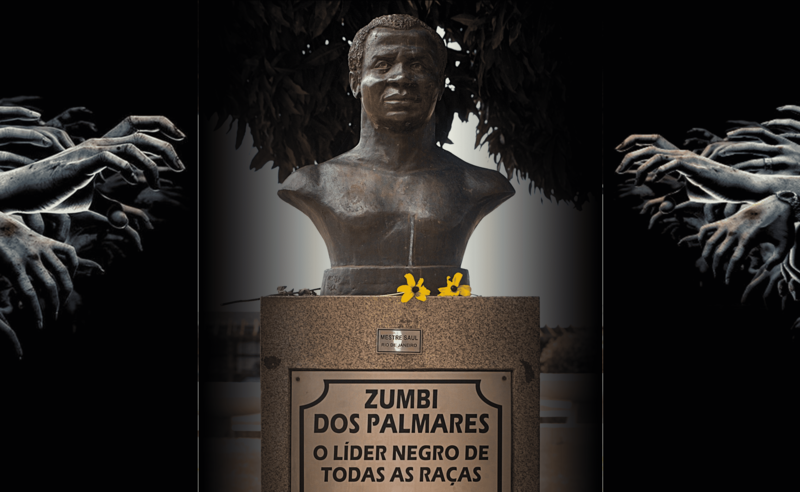 Zumbi is regarded as a national hero and a symbol of the struggle for freedom. In Brazil, Black Awareness Day or Black Consciousness Day (Portuguese: Dia da Consciência Negra) is observed annually on November 20 as a day “to celebrate a regained awareness by the black community about their great worth and contribution to the country”. Black Awareness Day has been celebrated since the 1960s and has amplified its events in the last few years. Originally, it was celebrated on May 13 (the date of abolition of slavery in Brazil). It was later moved to November 20 to honor Zumbi’s death and is sometimes called Zumbi Day. To conclude, our hero Zumbi is far away from zombies nowadays. Be alert, don’t follow media blindly. Reality may shock but it’s better than illusions.